On this the day before Thanksgiving I am thankful for the God of Hope. When I think about our needs at the top of the list is the God who loves us, Jesus who gave His life for us, and the Holy Spirit who not only makes both of them real but also sustains us. And then comes Hope. I am thankful for Hope. Not hope in its wishful thinking mode but Hope in its God will see it through mode. Hope in its God will see it through mode not only illuminates the darkness of hopelessness it also gives us the motivation and strength run, walk, or crawl toward and into the Light at the end of the tunnel. For me this morning’s opening verse is not only filled with Hope but also with Vision. 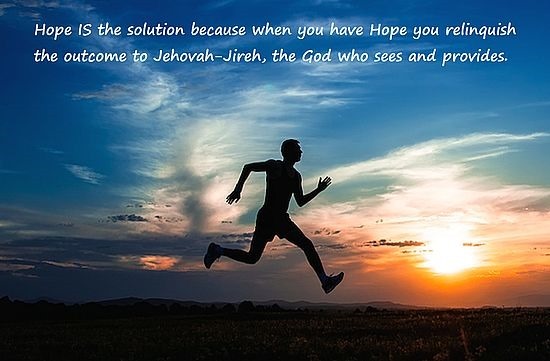 I have learned over the years and it’s the lesson I want to pass along to you, Hope (in its God will see it through mode) doesn’t necessarily solve our problems and difficulties, Hope IS the solution because when you have Hope you relinquish the outcome to Jehovah-Jireh, the God who sees and provides. The day will come when I will once again be able to run and jump, it will probably not be in this life but then with Hope the next life becomes alive. As my good friend Robert Campbell said and lived, “Keep Hope Alive!”. Happy Thanksgiving my friend! And have a second helping of Hope! May your focus be on Jesus and may the Holy Spirit nurture and grow the Seeds of Blessing planted in you. Note: Should you want to go back and review this Glory Seed or if you would like to subscribe so you can receive them in your email you can do so by clicking on this link: Glory Seed Devotional Blog.